You asked for it, so here it is. . . our party food recipes! Even though we don’t claim to be particularly skilled in the culinary arts, we do like to eat and we know how to choose tasty recipes. At our recent Spark Peek of the Season party, we set up a soup bar with a selection of tempting “mix-ins”. It was a huge hit (according to your praises) so we highly recommend you try this idea at your next gathering. Choose a smooth, creamy soup base recipe like Calabaza, Corn and Coconut Soup from Epicurious. 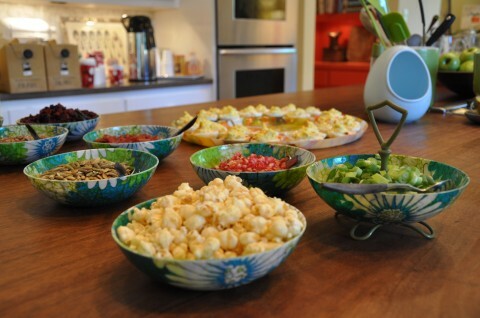 Using small serving bowls, arrange a selection of soup toppers that bring in sweet, savory, crunchy and salty flavors. We chose pomegranate seeds, toasted pumpkin seeds, chopped pecans, bacon pieces, dried cranberries, chives, cilantro, kettle corn popcorn (surprise!) and corn relish (part of the original recipe). The fun is in combining different flavors with each cup of soup! 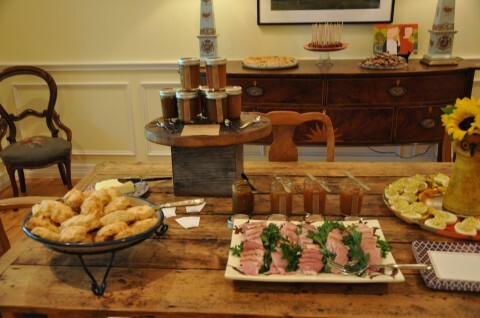 Along with the soup, we served honey baked ham, cheddar pepper biscuits, and a delicious array of gourmet jellies from Confituras. The biscuits and ham were a perfect compliment to the soup and made for an easy holiday buffet. To round out (pun intended) the feast we made a Southern style favorite, bourbon pecan balls. To make these truffles less messy, we speared them on lollipop sticks for a more child-like treat. . . but with bourbon. What are your favorite holiday or party recipes?